we went to a movie the other day. Totally not the point of this post, though. 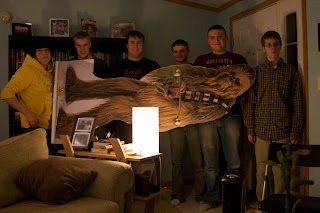 we noticed a large display of lifesize cardboard cut outs of movie characters. Edward Cullen, Jacob Black, Marilyn Monroe, Nicole Kidman, Yoda and..
At that moment, I had one of the greatest epiphanies of my youth leader life, thus far. We need a mascot.... we need Chewbacca. So we got him. A mere $35. I say it's an investment. He is going to be at every youth event from now until... forever. I must confess, he is really a little creepy to have around the house. Which is why he stays in the office, facing the wall. I'm still working on my Chewy "call". It is an art, my friends. Mostly because I feel really stupid when I try it. ahahaha that is hilarious! 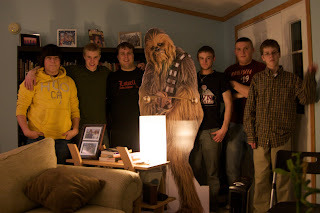 Chewy is an awesome mascot.